The fictional character created by Sir Arthur Conan Doyle called Sherlock Holmes, is in fact ageless, immortal, invincible, and unchanging to the public eye. Plus you can also get to see him in this 65 minute movie made in 1942. It was Directed by John Rawlins; and it Starred: Basil Rathbone, Nigel Bruce, Evelyn Ankers, with Henry Daniell. At the bequest of Sir Alfred Lloyd (Henry Daniell) and the rest of his elusive 'inner council', I have been asked to investigate a threat that has been plaguing England since the advent of World War Two. Now to all in sundry this threat has given himself the pretentious name, 'The Voice of Terror', and for reasons of his own, he has publicly broadcasted the unscrupulous acts he has committed on our one time pleasant land. 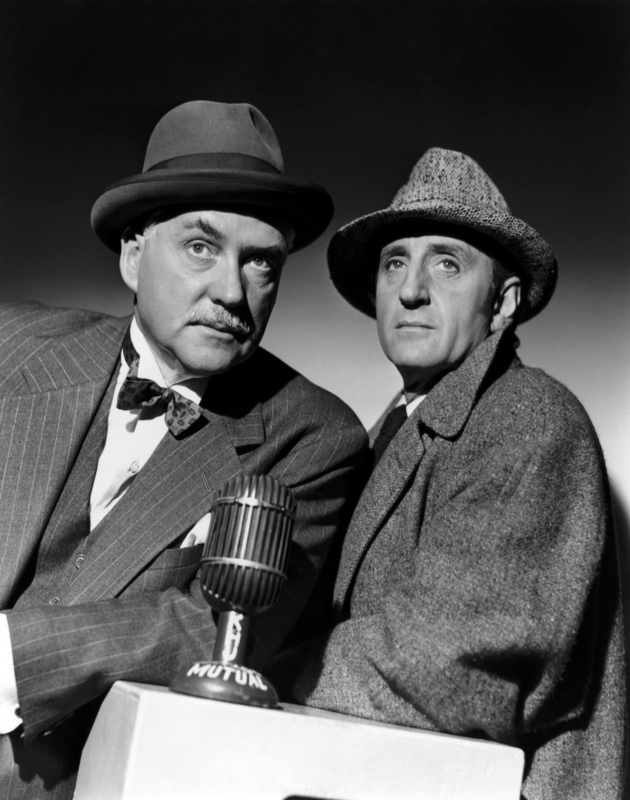 Of course, both Doctor Watson (Nigel Bruce) and myself aren't very pleased about any of this. And so we have decided to set forth and do our utmost to track him down with a very cunning plan. No, my friends! I am unable to divulge the contents of my plan at this present moment in time. 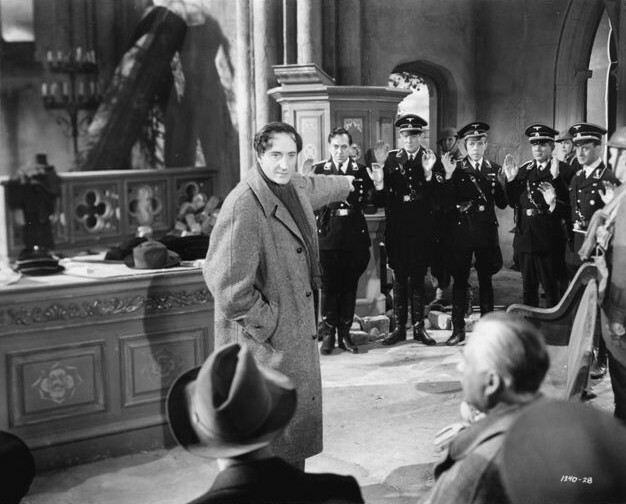 But what I can say is that I do seek out a very nice lady called Kitty (Evelyn Ankers), and instruct her to rally the people living in East London to aide our nationalistic endeavors. Furthermore, once she has eventually accomplished the task I have set her, I then use all my deductive reasoning to figure out what it at the very heart of this Nazi invasion. Yet again, that's most probably why what next transpires all goes from bad to worse when old Watson says to me, 'Holmes (Basil Rathbone)! Why is that German pointing his gun in our direction?'. As R.F. Meade (Thomas Gomez) makes his presence known - why can't those goose-steppers use a bloody phone - I fear the inner council may have a sneaky leak - and at the end of the day, what was it that Jesus said about the meek? 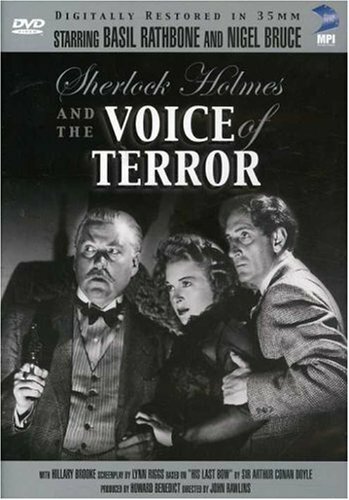 As soon as I sat down and watched 'The Voice of Terror', nigh on straight away I couldn't help but notice how tonally different it was from some of the other Sherlock Holmes movies I've seen directed by Roy William Neill. Of course I do mean this with all due respect. As I totally loved watching most of the film's Roy directed throughout the remainder of this series. It's just that this time there was a more expansive and more lavish feel to the overall production. And you can clearly see it in the way that the sets are grander in scope (like at the end of this flick for instance), plus how certain character driven moment are more apparent as well (like that time when Watson tells Holmes not to wear his deerstalker hat). Now I do have a sneaking suspicion I know why this is, however, I think it best it if I leave that for my filmic fact section later on. For the moment, I would just like to riff off some of the other aspects about this adventure I got a right kick out of. Firstly, I must mention that I was thrilled with the way Sherlock interacted with that man he sent to prison. Even though this section wasn't an integral part of the basic story-line, I have to say that I smiled like a baboon when Holmes explained right to this bruiser's face how he was able to send him away. Secondly, it was nice to see the actor, George Zucco, work side by side with Holmes in another capacity instead of playing Professor Moriarty. Honestly, dear reader. A part of me was very excited when these two fine actors reluctantly joined forces to counteract the matter at hand. Thirdly, the tale in itself had a somewhat philandering approach of unraveling itself. Despite the pretext being explained at the beginning of this escapade, once Sherlock reached the East End of London and started to mingle with the locals, well, the central narrative did zig zag about in a rather ominous manner. Especially those segments involving the Kitty character. As I was never a hundred percent certain about her involvement until the final end reel. And lastly, I have to state for the record that I did love watching this movie in spite of everything I've previously said. In many ways the whole package was well acted, well presented, and more or less, well told too. Anyway. That's enough of that for the moment, my friends. Here. Let us now check out the following filmic-facts. (1) 'Universal' first released this production in America on the exact same day the United States was first bombed during Word War Two. It was on the 18th of September, 1942. (2) There were two taglines used to promote this picture. The first one was simply, 'THE MASTER MINDS OF MYSTERY!'. Where as the second one was more long-winded, and stated, 'From Conan Doyle's gripping books! From your favorite radio mystery! THE MASTER MINDS OF MYSTERY leap to life to challenge the menace of modern crime!'. (3) This was the first full length feature film to star the venerable New York actor, Thomas Gomez. (4) During pre-production this project was given the working title, 'Sherlock Holmes Saves London'. (5) That preliminary scene where you can see a train going off the rails was actual footage taken from the 1933 classic, 'The Invisible Man'. (6) Certain elements seen in this movie were loosely based on the Sir Arthur Conan Doyle 1917 story, 'His Last Bow', as well as depicting select events taken from the war-time radio show, 'Lord Haw-haw'. (7) Not only was this the first 'Basil and Bruce' Sherlock Holmes adventure not set in the Victorian era. But it was also the first one produced at Universal Studios. 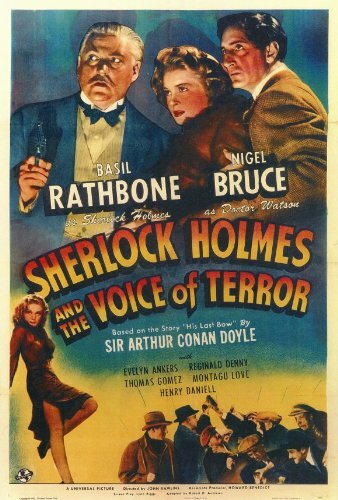 (8) After this flick patted itself down, Basil Rathbone starred in the next Sherlock Holmes murder-mystery, 'Sherlock Holmes and the Secret Weapon'; Nigel Bruce starred in the war-time drama, 'Journey for Margaret'; and Evelyn Ankers starred in the thriller, 'The Great Impersonation'. Now did you check out point's six and seven of my trivia-splurge, dear reader? 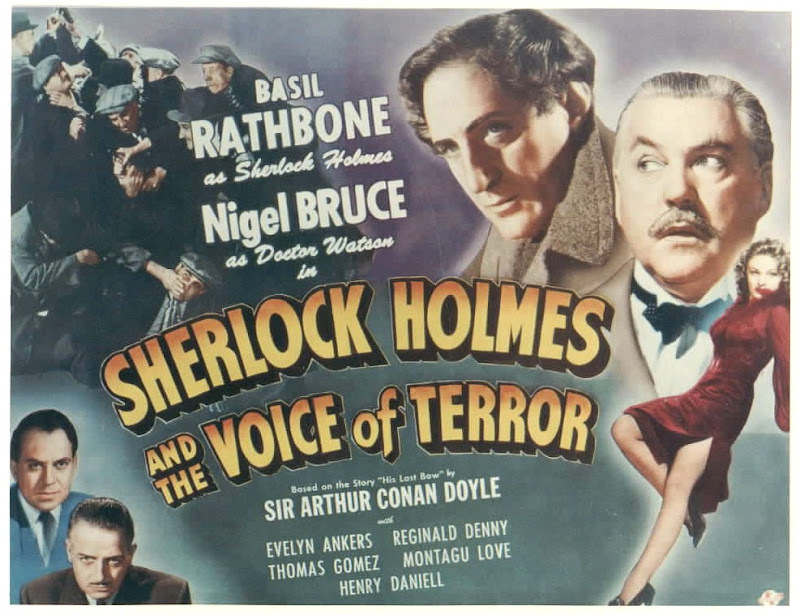 As that would explain why 'The Voice of Terror' felt different compared to some of the other Sherlock Holmes movies I've seen. It felt different because it was the first of the first of a new breed of adventure I've really grown to love sitting down and trying to figure out. Great film. Amazing in places. Philandering in others. Nuff said.